The registration process begins with the user (that's you!) deciding what level of service is wanted. 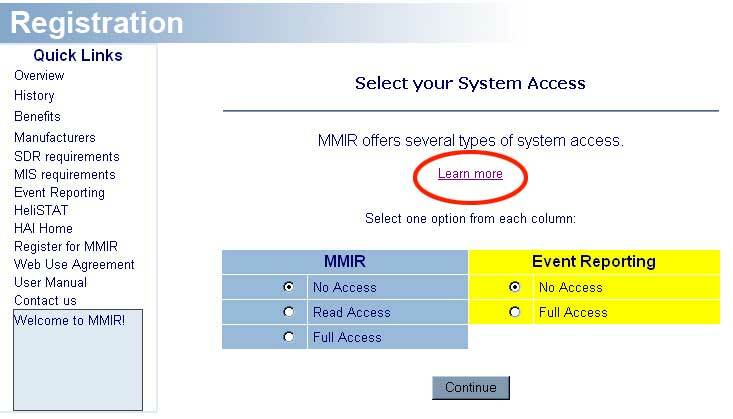 If you are not already familiar with MMIR Read Access and Full Access, and Event Reporting, you can click on the big "Learn More" link. MMIR Read Access allows the user to run reports based on the information in the system. Information is available on specific parts (defined by part numbers) and on specific aircraft models. The information provided is abridged to conceal the identity of the submitter. MMIR Full Access is appropriate for operators, repair stations, and certified technicians who file warranty claims, service difficulty reports, and mechanical interruption summaries; or for anyone who simply wants to keep track of maintenance on their aircraft. Full Access MMIR reduces workload tremendously. SDRs are automatically forwarded to the FAA; there is no redundant paperwork or mailing involved. Most manufacturers accept the MMIR form for warranty claims. With MMIR, printing the form in a crisp PDF format is a snap. You can use MMIR as an internal maintenance tracking program. Simply select the "Internal Use" option. The report will be stored exclusively in the MMIR server, with no external processing (i.e., not forwarded to FAA or manufacturer, and not accessible to other parties). Of course, you can review and amend the report, and formally submit it later if appropriate. Full Access users also have the option to subscribe to HeliStat, a value-added service that provides advanced statistical analysis of MMIR data. HeliStat can red-flag potential problems, track individual aircraft, and produce trend analysis and graphic summaries. HeliStat is available on a paid-subscription basis. After you register for MMIR Full Access or Event Reporting, someone from HAI will contact you to verify your request and activate your account. So choose the options you want, then click the "Continue" button. Registration is specifically tailored to the options you choose in a step-by-step process. Registration will take 2-3 minutes, and must be completed in a single session. Name fields: MMIR extracts your initials, appropriately enough, from the name you enter here. Your initials will be attached to any report you create, edit, or finalize. Company name: You can use up to 2 lines for the name of your company, company/department, company/office, or so on. Station Certificate #: Enter the first 4 digits of your FAA repair station authorization number. For non-U.S. users, please enter the first 4 digits of your certifying authority's license number. If not applicable, enter NONE. Primary Submitter: When submitting Service Difficulty Reports or Mechanical Interruption Summaries, the FAA keeps track of the type of entity submitting the report. It may be a certified repair station, operator, individual technician, or something else. You can always change the type of submitter for any report. For registration purposes, use this pull-down menu to select which entity you want to be for default purposes. If you opt to add additional users (described below), you may designate them individually. Phone: Include phone and fax numbers most direct to the user. E-mail: Your e-mail address is critical. It serves as your User ID when you log on to the MMIR system. It is also the automated contact point between you and MMIR. MMIR issues notifications and alerts to the user's e-mail address of record. Also, you cannot register if the MMIR acknowledgement message bounces back. Password: Along with your e-mail address User ID, you log on with a password of your choosing. Your password must be at least 4 alphanumeric characters in length, and is not case-sensitive (small letters or CAPS, it does not matter when you log back on). You can change your password later. 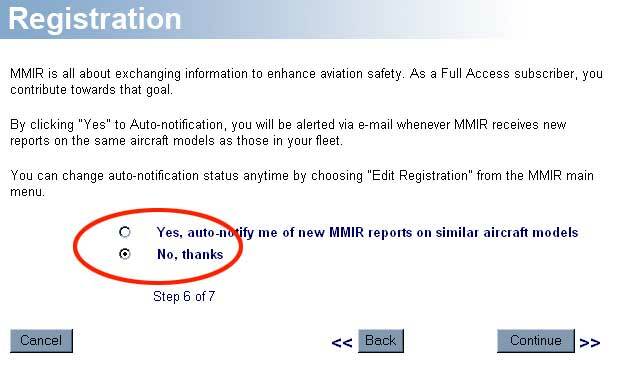 Auto-notification: By clicking "Yes" to Auto-notification, you will be alerted via e-mail whenever MMIR receives new reports on the same aircraft models as those in your fleet. Obviously, you have to keep your fleet information in MMIR updated. You can change auto-notification status anytime. Anonymous Users: To allow Anonymous Reporting, select Yes on this registration screen. Select a password of at least 8 alphanumeric characters. This password should be different from any user's MMIR password. Then click Continue. You will have the opportunity to print instructions for employees to use Anonymous Reporting. 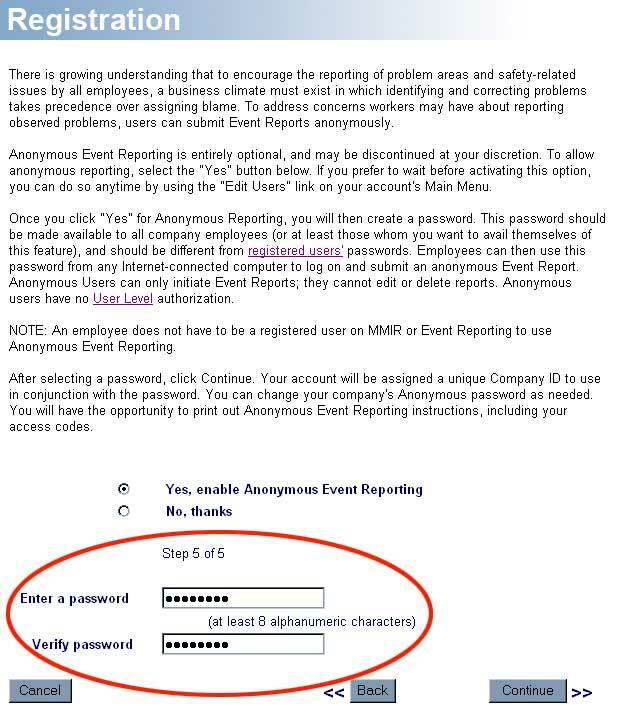 If you are not sure you want Anonymous Event Reporting right now, choose No. It's easy to add Anonymous Reporting later. The final screen in the registration process is a summary listing of users. You can now add additional users, and assign user levels and passwords. If you enabled Anonymous Reporting, you can print instructions to disseminate to employees. In the screen image above, look at the area circled in red. The button indicates that Anonymous Event Reporting is "Enabled." So, how do you let your employees know how to use it? Easy. Just click on the "Print Instructions" link. The resulting display will include usage instructions, as well as your company's User ID and password. You can print the image, or you can print a cleaner copy of the same information by choosing the "PDF version" link. Both are single-sheet instructions explaining everything. Additional Users: MMIR Full Access subscribers and Event Report subscribers, can add additional users to their account. This means that all authorized individuals may enter, review, and edit all reports specific to that company, using their unique ID. MMIR tracks all recordkeeping functions, so it is easy to determine who did what. To enter additional users during the initial registration process, just click the "Add Additional User" button. You can add as many additional users to your account as you like. But, unless you are going to assign their passwords, you may want to confer with them first. Click on the "Done" button when you are finished registering. Once your account is activated, you can edit your registration, add/edit/remove additional users, and change Anonymous Event Reporting status anytime. Remember, for MMIR Full Access and Event Reporting subscribers, you will be contacted by an HAI representative to verify your request before activation. You will not be able to access the features of these programs until your new account is authorized. This process usually takes less than one business day.